The biggest topic of discussion in the urban policy Nerd-o-Sphere yesterday was the surprise and sudden announcement by Amazon that it was pulling out of its agreement to set up it’s second (third) headquarters in New York City. The 3 billion in local and state subsidies were under threat by civic groups, and either in a strategic move designed to preserve future incentives at other locations or in a fit of pique over having something it wants, Amazon announced that it was withdrawing from the agreements. It’s kind of amazing to be seeing something in the news and know that it will result in at least a dozen different PhD dissertations. I really hope someone is collecting all the different pitches cities made to Amazon so we get a sense of what policy levers cities think they have for attracting major investments from knowledge-based companies. After the withdrawal, the finger-pointing started. Amazon said they planned to create 25,000 jobs, which in turn will create more jobs outside of Amazon thanks to what those employees would spend. There would be a boost to Long Island City’s real estate market as Amazon would become a massive anchor, attracting new residents to New York and boosting commercial spending. While the city and state would give more than 3 billion in direct subsidies and forgone taxes, the idea is that this would be more than made up by the increased tax base the HQ would create. Smokestack chasing is a venerable economic development policy. Offering subsidies and tax benefits to an employer to come to a region can boost employment, create local supply chains, and help build a virtuous cycle that leads to more economic growth through entrepreneurship and a higher skilled workforce. But such efforts are usually the domain of smaller, more peripheral regions with high unemployment rates, low wages, and cheep real estate. The goal of bringing in a major firm through tax subsidies is to create an ecosystem that goes beyond the single company. New firms can spin off of the anchor as entrepreneurial employees find opportunities and reasons to hate their bosses. Employees get unskilled, either through investments the firm (and the government) made with local universities and colleges or just through the experience at working at the company. Corporate accelerators can spur local startup activity and connect it with the strategy of the anchor firm. Senior managers can act as investors and mentors to newer firms, helping them grow. All of this helps the economy grow, which is a good thing. But NYC has much different dynamics, which make the sheer size of the subsidies seem silly. New York City’s unemployment rate is 3.6%, which is pretty much full employment. The unemployment rate in business service and information technology will be even lower. That means that Amazon creating 25,000 jobs will increase wages across the board for IT workers throughout the Tristate area. In theory this is a good thing, but wages are already so high, this will make it harder for new and growing firms to find the talent they need to grow in NYC. It’s questionable if NYC’s public transportation system can even handle that much increased employment in Long Island City. And Amazon’s hiring won’t just be local: it will attract thousands of new workers to the region who will heat up an already ridiculously overpriced housing market. In an overheated economy like New York’s, we should be asking very tough questions about how these subsidies will increase the social welfare of the entire city. In most places in the world, the creation of this many high-paying jobs would have been a great thing. But NYC isn’t one of those places. The money that was promised to Amazon would go a long way to keeping the subway from collapsing or building the social housing that is desperately needed. But once those questions were asked, Amazon cut and run. Economic development officials need to start realising that too much of a good thing isn’t always great. The point of subsidies is that they aren’t needed after a certain point: you build a sustainable business ecosystem that then creates its own incentives for future growth. Over the past few weeks, a whole host of new articles have come out on entrepreneurial ecosystems and related concepts. I think it's getting to the point where it's hard for one person to have read everything on the topic, if that was even possible. It's really great seeing the field develop over the past few years. Without further adu, here are some papers that I think are worth checking out. I haven't read all of them yet, but I think I'll be citing a lot of these papers in the future. Why I think this is interesting: A bit of a cheat, since I wrote this. But you should read it! The point of this article is to really think about what we study when we study ecosystems. Richard and I argue that we should really look at the practices entrepreneurs use to get resources within an ecosystem rather than the ecosystem itself. Why I think this is interesting: I'm always a fan of careful mixed-methods case studies of individual ecosystems. Anything that combines network analysis and longitudinal study are going to go to the top of my reading pile. Why I think this is interesting: Why I think this is interesting: Part of my evolving thinking about ecosystems is that they are primarily about entrepreneurs learning about entrepreneurship. However, this only works if entrepreneurs are actually open to learning about entrepreneurs. So, I've been trying to understand how open entrepreneurs actually are to learning from others and actually changing what they do. Why I think this is interesting: At the end of the day, ecosystems is just the newest way of thinking about the tension between structure and agency within the entrepreneurship process. I'll always read any article that tries to figure out what the balance between these two forces (though I'm a bit salty they didn't cite my article on the topic in ERD). Why I think this is interesting: A bit of a deep cut here. It's not exactly about ecosystems, but I think this will be a useful critique of who we think of as the typical 'ecosystem entrepreneur.' We need to make sure we're critiquing the concepts and categories we're using. Why I think this is interesting: Not going to lie, I'm a bit salty this paper didn't cite me too. But I'm so desperate for good research articles on ecosystems from outside the UK and Western Europe I'm willing to overlook that party foul. Why I think this is interesting: Every third person I've talked to about ecosystems has said they're doing something on social enterprise ecosystems, but this is the first paper I've actually seen on it in the wild. I've got my own poker in this fire, but it's good to see that others are exploring this issue. What happens when the success story stops being a success? Some less than great news about Fanduel, one of the most prominent success stories of Edinburgh's entrepreneurial ecosystem. According to the New York Times, both it and its main competitor Draft Kings are running low on cash. Within the past three weeks, the New York-based FanDuel has laid off more than 60 people, and both companies have acknowledged that they are months behind in their payments to vendors, especially to the array of public relations and lobbying firms that they have employed across the nation to persuade individual state legislatures to legalize daily fantasy games — the most critical component of rebuilding their business. But what happens when that success story succumbs? What would happen if (knock on wood) Fanduel and Draftkings make a desperation merger that results in widespread layoffs in Edinburgh and the loss of its local offices? Immediately, the impact would be big but not devastating. LinkedIn shows about 100 Fanduel employees based in Edinburgh. These are all really highly skilled people, both on the tech and managerial side. I have no doubt that those who wanted to would quickly find jobs at other local tech firms, from large ones like Amazon's local R&D lab to Skyscanner to smaller but still up and coming tech firms. Others would go abroad or down south to London depending on how deep their ties are to the city. We might even see a small spike in entrepreneurship as people who have been playing around with the idea of starting a company now take their severance and make a play. Longer term, it's hard to say. I feel that while right now Edinburgh (especially it's digital tech sector) has a very positive, supportive culture. But I think that this culture is rather fragile. We don't talk about failure. Richard Yemm and Pelamis Wave Power — a wave energy company in Edinburgh that went into administration in 2014 — used to be the toast of the town. Everyone was celebrating the advances it made. But after it went into administration not another word was spoken about it (except to blame the Chinese for stealing their technology). I've seen similar things happen in Ottawa after the collapse of Nortel in 2000. I've written about it with varying amounts of puns here and here and wrote a pretty decent book chapter about it here. Ottawa saw about a decade of retrenchment after the collapse of Nortel, with significant loss of talent to other regions. While the economy has recovered, the technology scene has shifted far away from the heavy duty networking technology Nortel was known for towards SaaS, including Shopify, one of the world's leading e-commerce platforms. What I noticed in Ottawa after the collapse of Nortel but before the rebirth of its SaaS economy was a big depression in it's entrepreneurial culture. In a recent article I've written in the Journal of Economy Geography, I show how this lead to fewer people finding entrepreneurial mentors, a crucial ingredient in a thriving entrepreneurial ecosystem. There were other knock-on effects: the lack of a strong entrepreneurial culture made it hard to create a cohesive entrepreneurial community. There was a big divide between the new startups downtown and the tech companies in the suburbs. They just didn't see eye to eye. The city didn't know who to support or how to support them because the firms couldn't come together in an organized fashion. So what does this tell us? It means that while the collapse of any one firm might not have immediate impacts on a city's entrepreneurial ecosystem, it does suggest that entrepreneurial cultures can be very fragile in small-sized ecosystems with just a few real big success stories. It's more than a bruised ego, a damaged entrepreneurial culture can discourage the kind of risk taking that startups need to scale up and can make it harder to attract new angel investors and venture capitalists to the region. How can ecosystems preempt this? There's no one silver bullet. Firms fail. It's part of life. All you can do is be prepared for it. One thing places can do is try to be more tolerant of failure. Celebrate failure as a learning opportunity rather than as personal failure. It's hard to do but necessary. Second, ecosystems should make sure that people recycle through it rather than leave. If Fanduel folds, there is an amazing pool of highly skilled, talented people. How can we make sure that they find jobs in the ecosystem rather than heading to sunnier climes? 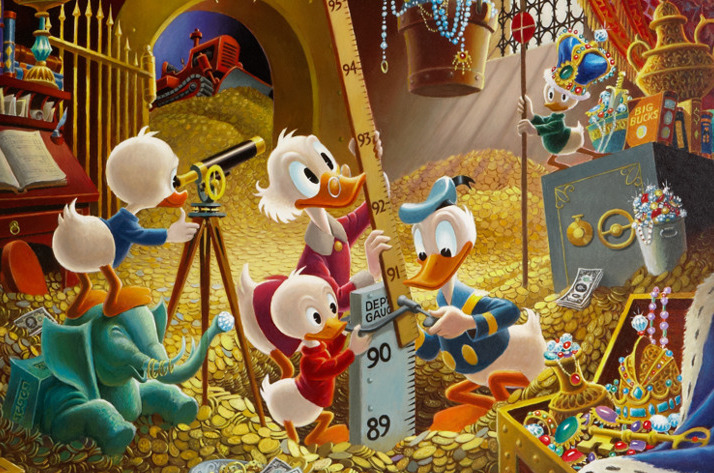 After the collapse of RBS, Edinburgh set up a senior management bank to help tap the talent pool that suddenly became 'available.' But it's also about providing targeted support for the recently laid off to make sure that local firms have a first shot to offer them new opportunities or that they receive startup support relevant to their needs and abilities. Will Fanduel suddenly collapse? I hope not. But an ecosystem so dependent on its successes that it can't outlive them isn't a very stable ecosystem to begin with. Wired Magazine recently ran a profile of the top startup cities in Europe. They profiled the most exciting startups in Stockholm, Amsterdam, Paris, London, Lisbon, and Helsinki. Noticeably absent from this list was Edinburgh. 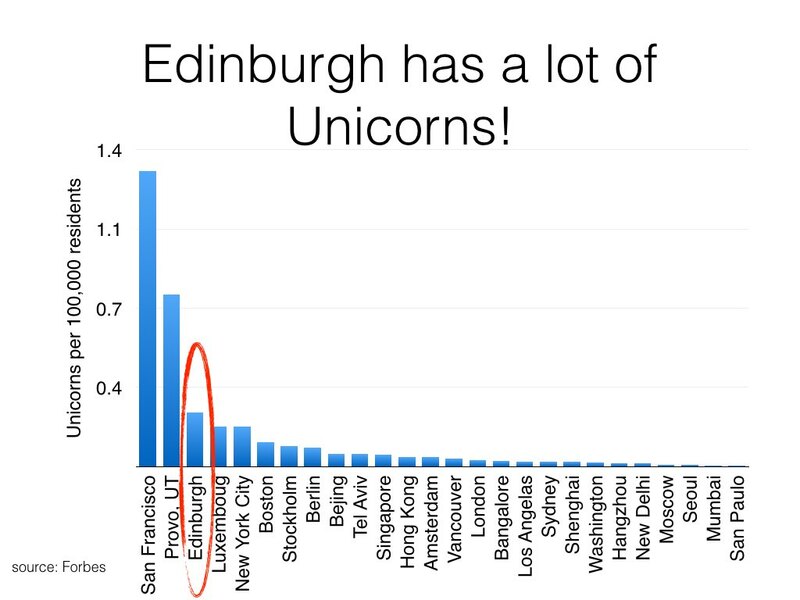 Edinburgh has the highest per capita rate of 'unicorns' in Europe and the third world wide. It has one of top performing private accelerators in the world in CodeBase and one of the world's best computer science departments. The question is: why it didn't make the list? This isn't just a question of the ego of a city (or my own ego) left off the hot or not list. An entrepreneurial ecosystem's global profile has a big impact on its future success. Ecosystems aren't real things that exist; much like Tinkerbell they only live as long as people believe in them. A place's perceived success will attract investors to it as well as budding entrepreneurs and startup employees. Generating a buzz about a place helps make it easier to get people to lend their time, energy, and passion to organising and running the entrepreneurial groups that make up an ecosystem. Companies benefit from this. This creates a virtuous cycle: successful entrepreneurial ecosystems create attention which helps establish the place as an 'entrepreneurial city.' This helps attract talent, investment, and customers. This in turn helps the ecosystem perform better, increasing the attention it gets from the global business press and community. Rinse and repeat until they make an HBO show about you. The challenge for Edinburgh is how can it stop punching below it's weight? How can it attract media attention that goes beyond the local Scottish press (with the occasional profile from the FT when they venture North of the Wall). Part of the problem is that the city's two big successes — Skyscanner and Fanduel — aren't really connected to the place. Not to say that they aren't engaged with the community, they are, but the businesses themselves are disconnected from Edinburgh. Fanduel is for all intents and purposes an American company and Skyscanner is seen as a global company rather than a Scottish one. Good for Skyscanner, bad for Edinburgh. However, effectively branding an entrepreneurial ecosystem requires more than just press junkets and advertisements. It requires building a narrative that connects the history of the place with its future and helps explain why there is so much exciting activity happening there. A startup ecosystem isn't just a bunch of cool new ventures succeeding by themselves; it's an entire community that helps support innovative entrepreneurship. Waterloo, Canada is a great example of how to do this. The city has not only helped develop numerous high growth tech firms like Blackberry (not so high growth any more), Kik Messenger and Tribe HR, but also attract offices from players like Google and Microsoft. This despite being a fairly small city just an hour away from the much bigger metropolis of Toronto. Waterloo has worked hard to build a narrative that connects its Mennonite and German history with its contemporary technology success. Drawing on this, they've been able to create the myth of Waterloo as Quantum Valley. This has help attract substantial interest from investors and researchers. Ironically, Edinburgh literally pioneered the idea of city branding. Walter Scott, author of books like Waverly and Ivanhoe, helped brand Scotland and Edinburgh with the image of Tartan and Highlanders. He used this image to arrange a trip by King George IV to Edinburgh, which was a boom to the city's businesses. Now this is how you build an ecosystem! What can regions do to try to build their global ecosystem brand? While ecosystems need a diverse range of actors experimenting with new ideas, successful branding seems to require a prime actor. Communitech in Waterloo has been successful in part because everyone in the community sees it as the most important agency for building Waterloo's global brand. Everyone needs to help. That single organisation can't do everything on its own. Companies and entrepreneurs should be proud about where they come from and why that place is great. Internal communication is as important as external broadcasts. Building a shared story about the ecosystem needs to happen internally. It can't be imposed from the top down but has to emerge through consensus and shared myth making. I've been doing some interesting work on entrepreneurial ecosystems lately. I just published a paper in Entrepreneurship Theory and Practice on ecosystems (hint hint) but that was just the start. One of the points I made in that paper is that entrepreneurial ecosystems depend on more than just entrepreneurs. Look, entrepreneurs are the most important thing, but there are a bunch of other people that matter. Now, we know that angel investors are important and Kenney and Patton said that we should pay attention to folks like patent lawyers and accountants. Obviously you'll want experienced, successful entrepreneurs who can serve as mentors for future generations of firm founders. 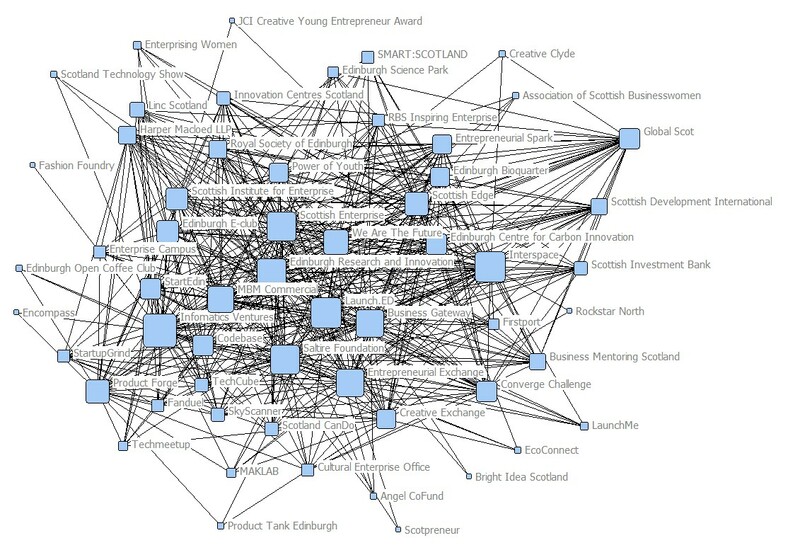 But I've been talking to a lot of entrepreneurs, policy makers, and other people in Edinburgh for the past month and from those conversations I think we need to think about a broader group of people that you need to make an effective ecosystem. First of all is sales people. I think sales is the toughest nut for entrepreneurs to crack, especially entrepreneurs who see themselves as 'technologists' or 'innovators' rather than businesspeople. Heck, even businesspeople don't think of themselves as sales people: how many business schools or MBA programs actually teach sales techniques? The answer is Not Many. How many books on entrepreneurship actually talk about sales beyond a very simple 'it would be nice if you sold some stuff'? But salespeople are very important for startups! Salespeople are typically the first employee at a startup that actually gets a real, competitive salary. They are instrumental in building connections with customers and landing the deals that actually pay for product development. But new entrepreneurs often have a lot of trouble working with sales people, they really don't know how to pay them, how to measure their effectiveness, or how to help them do their job. And if I'd have to guess, I doubt there are a lot of salespeople who like working in the structureless environment of a startup. And this is where the trouble starts: there's been a 20 year debate in the academic research over if entrepreneurs are born or taught. The debate is still going on but there seems to be a consensus that we can at least try to instil an entrepreneurial mindset in people if we catch them early enough. There's be no discussion about this for sales. There is the basic assumption that salespeople are born; they are born with an extroverted personality, slicked back hair, and the ability to give a sales pitch so meaningful people run from the room crying and you never look at a slide projector the same way. This may or may not be true: I hate talking to people yet during my PhD I learned how to make cold calls to entrepreneurs in order to sell them something they truly didn't need — an hour of their time spent with me. So we're left in a situation where we assume that since we can't teach sales entrepreneurs will just draw on what ever local talent exists and hope for the best. The problem is that there doesn't appear to be an even distribution of sales talent. We're lucky that the ONS's Labour Force Survey provides detailed occupational data so we can actually see where specific types of salespeople are in the UK. 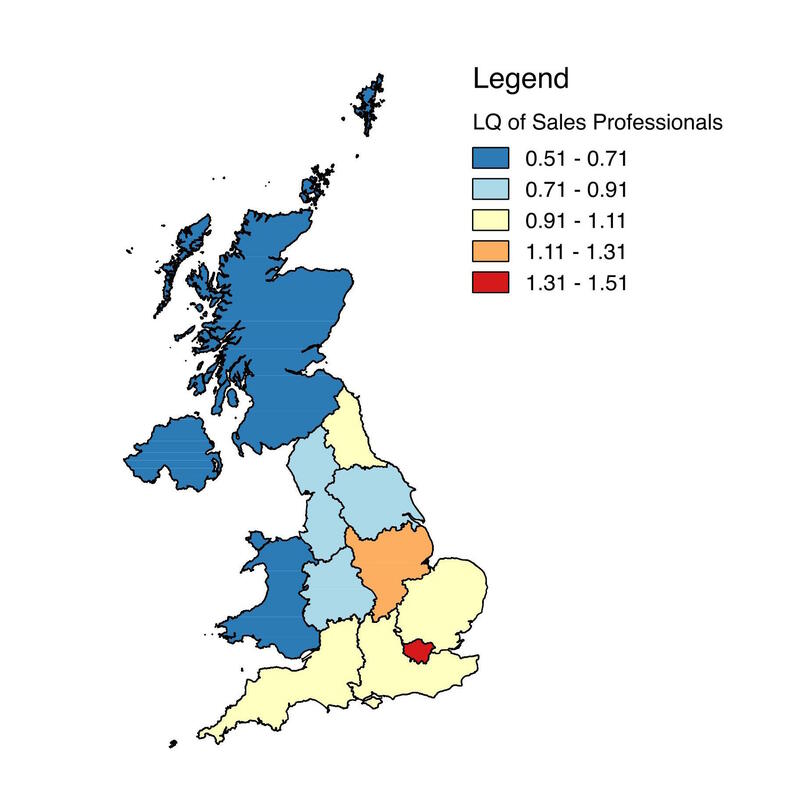 The map below displays the location quotient (LQ) of sales professions: not telemarketers or retail salesclerks but Marketing and sales directors, Business sales executives, and Sales accounts and business development managers. These are high level salespeople and managers. LQs are a nice metric for this sort of thing since they show the ratio of a certain profession to all other professions while controlling for population and other factors: an LQ above 1 means that the concentration is higher than the national average and below 1 means it's lower. Not unexpectedly, London has a huge cluster of sales professionals: London is a global city filled with sales based companies, this is exactly where you'd expect them to be. But the map shows big problems for Northern England, Scotland, Wales, and Northern Ireland. These places have almost half the national average of sales professionals. This means that when startups go looking for salespeople, they have a smaller pool to draw from. They'll either have to pay more or get a lower quality worker. It means there's a smaller support infrastructure for salespeople to build up their skills and learn how to manage other salespeople. What does this tell us? Typical region policy to support entrepreneurship focuses on training entrepreneurs first, then trying to educate potential angel investors, and maybe they have a workforce development program to help train people in computer programming or whatever else it hot right now (is Internet of Things a job yet?) But no one is really thinking about (1) how can we train more and better salespeople and (2) how can we train entrepreneurs to be better at working with salespeople. Having a broader conception of who matters in entrepreneurial ecosystems makes it clear that this should be a priority.